I know it doesn't look like much, but this was a really flavorful dish. Roasting the vegetables is the trick. It brings out the sweetness and creates a yummy sauce from all the juices. My inspiration for this recipe came from Ina Garden's recipe Orzo with Roasted Vegetables. I used the same dressing and it really gives the pasta a nice zing! With the holiday fast approaching things have been pretty hectic lately. Between nursing a back ache and now trying to get over a cold, it has been a real challenge to get anything done. I did manage to bake my usual cookie marathon. I made so many cookies, bars and brownies that my head is still spinning. I spent all day Saturday from 9:30am to 9:30pm decorating and packaging them all. Now I have to figure out how to deliver all of them in the mist of all these snow storms. I got over a foot of snow in my neck of the woods. I hope everyone has a Merry Christmas and a safe and happy holiday! Toss the eggplant, bell peppers, leeks, shallots, olives and garlic with the olive oil, salt, and pepper on a large sheet pan. Roast for 45 minutes, until browned, turning once halfway through cooking. Meanwhile, cook the pasta according to package directions. Reserve 1/4 cup of the cooking liquid; drain and transfer to a large serving bowl. Add the roasted vegetables to the pasta, scraping all the liquid and seasonings from the roasting pan into the pasta bowl. 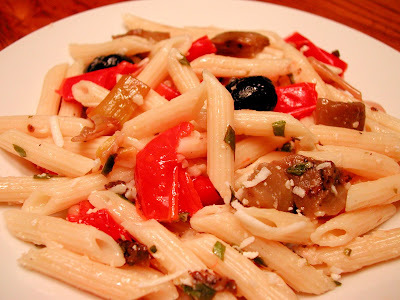 For the dressing, combine the lemon juice, olive oil, salt, and pepper and pour on the pasta and vegetables. If the pasta is a little dry add some of the cooking liquid. Add the pignolis, Pecorino, and parsley. Taste for seasoning and serve. May also be served at room temperature. I never seem to have luck with eggplant, but this looks like a dish worth trying! Thanks for the holiday wishes, I hope you have a wonderful Christmas too! Thanks also for you comment a few weeks ago about the lasagne. I kept forgetting to leave a comment for you telling you how much we enjoyed it! It was wonderful. I had no idea that a squash lasagne could be that great! I love roasted vegetables, I think they may be one of the most perfect foods. 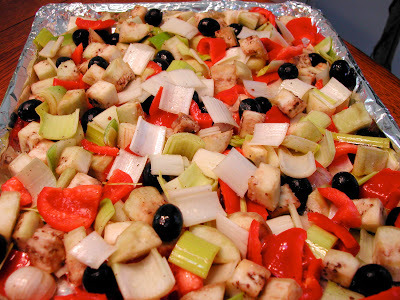 I've been thinking of you lately and then I saw your comment on my blog so I had to post on yours asking "Any ideas for a yummy Christmas dinner fruit or jello salad?" My kind of meal! Looks delicious!